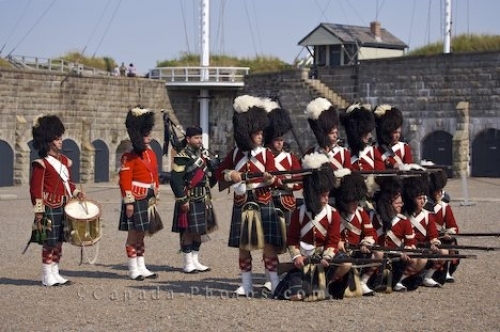 Dressed in full uniform, the troops stand in position in preparation for the rifle firing demonstration at the Halifax Citadel National Historic Site in Nova Scotia, Canada. The bagpiper, drummer and leader stand at the back while the other troops prepare. The sound of the rifle firing is extremely loud, so for any visitors who are sensitive to loud noises, it is best to cover your ears before the rifles explode. Rifle firing demonstration at the Halifax Citadel National Historic Site, Halifax, Halifax Metro, Nova Scotia, Canada. Picture of a rifle firing demonstration at the Halifax Citadel National Historic Site in Nova Scotia, Canada.